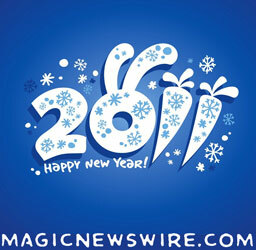 The Magic Newswire - Magic News - THIS WEEK IN MAGIC :: SAY HELLO TO THE YEAR OF THE RABBIT! THIS WEEK IN MAGIC :: SAY HELLO TO THE YEAR OF THE RABBIT! Welcome to the Year of the Rabbit! This just has to be a good sign for magicians right? In this episode of the podcast we wrap up 2010 and chat a bit about 2011 with the usual cast of misfits that has been joining me for our talks this year including Chase Goforth, Cameon Ramsay, David Kaye & Scott Wells. In addition, we toss in a few minutes with Mac King, Johnny Thompson, Pamela Hayes and Jonathan Pendragon before heading off to chat with our friends Dan Sperry, Rudy Coby Justin Robert Young, Andrew Mayne and Joe Monti as a part of the iTricks 2010 office party! Thanks for making us all a part of your magic life over the course of the last year and we look forward to bringing you more in 2011! Now get out there and start pulling some Hares!